Cold-Weather Driving Mastery for Your SUV Pick-Up or Crossover Vehicle. The special FleX-Ice™ compound is formulated to maintain its flexibility under the most extreme cold-weather conditions while Micro-Pumps and Cross Z Sipe technology provide improved stability in all winter conditions. The wide tread contact patch generates acceleration and braking power, as well as cornering traction for outstanding maneuvering on snow and icy roads. 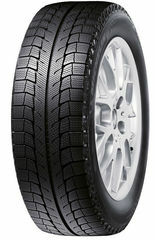 The MICHELIN® Latitude® X-Ice® Xi2 provides long lasting winter performance with sipes and Micro-Pumps that are maintained season after season and MICHELIN® Max Touch Construction™ which features a unique contact patch shape - maximizing even and longer tread life. At Michelin we continuously prioritize safety, durability, and fuel efficiency at the same time with minimal trade offs. That is the meaning of MICHELIN® Total Performance™ which will be our difference on every tire.